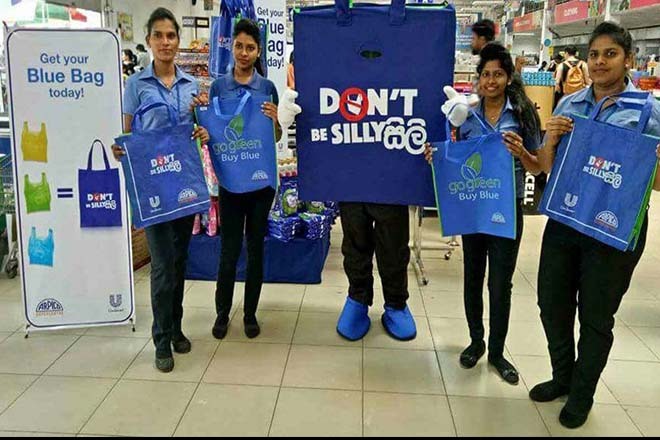 Unilever Sri Lanka and Richard Pieris Distributors Ltd. together carried out the ‘Don’t Be Silly Silly’ awareness drive to encourage shoppers to go green by switching to the reusable Arpico – Unilever cobranded blue eco bags at Arpico Supercentre outlets around the island. The campaign, which was kicked off in early July, saw consumers being apprised of the environmental issues stemming from the use of polythene shopping bags and how this could cut down considerably by simply switching to reusable bags. Offering further impetus to adopt the reusable bags, 5,000 bags were given away to shoppers of Arpico Supercentre. A number of shopping carts were preloaded with the reusable bags too to offer a more convenient shopping and check-out experience. Arpico team members too were incentivized to actively promote the reusable bags. Inspired to go green, shoppers at the 22 participating Arpico Supercentre outlets picked up close to 10,000 reusable blue bags during the first month, a marked growth of over 200% over the previous month. This switch led to the number of polythene bags being used during the 30 day period drop by about 100,000, thus eliminating a considerable volume of non-biodegradable waste from ending up in landfills. “At Richard Pieris, we are committed to minimizing the environmental impact of our businesses. Be it the launch of the reusable blue bags or the introduction of the Arpico Eco Privilege taxi and online delivery service, we have always strived to offer shoppers ever more eco-friendly choices. We are happy to partner with Unilever to raise awareness on the issues related to the use of polythene bags and encourage shoppers to go green. With about 100,000 polythene bags being replaced with reusable blue bags during the first month alone, we believe that initiatives like this will have a positive impact on the ongoing waste management crisis faced by the nation,” said Minodh de Sylva, Head of Marketing, Richard Pieris Distributors Ltd.
“True to our core business philosophy of ‘Doing Well by Doing Good’, at Unilever, we seek to make sustainable living common place in all the markets we are present in around the world. In line with this, we have partnered with Richard Pieris Distributors and their Arpico Supercentre stores on this initiative which encourages responsible consumption,” said Aruna Mawilmada, Customer Development Director, Unilever Sri Lanka.